Magic Peel is a base coat which enables you to peel off ANY Nail Polish of yours! Aren’t you tired of the same boring technique of removing our Nail Polish with acetone? Not only is it a tiring process but toxic for your skin. Safe ‘N’ Beautiful Magic Peel is a base coat which enables you to peel off ANY Nail Polish of yours! 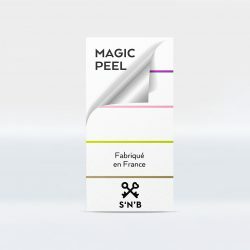 Paint your nails with Safe ‘N’ Beautiful Magic Peel, let it dry and afterwards paint your nails with any nail polish and when you want to remove the colour just peel off! Safe ‘N’ Beautiful is once again offering the best and safest quality cosmetics in the world!